Home / Hess Trucks of the 1960's / 1969 Hess Woodbridge Tanker Truck – Very Rare! This Rare 1969 Hess “Woodbridge” Tanker Truck is a very hard item to find. Comes complete with truck, box and all packing. The truck measures approximately 13″ in length. This truck is one of the most difficult editions to find in the Hess collection. Commonly known as the “Woodbridge” the decal placement on the 1969 Hess Tanker says “Gasoline” on the passenger’s side & “Fuel Oils” are on the driver’s. 1968 & 1969 trucks had a white base instead of a Red Velvet base found on the 1967’s. The battery cover on the 1968 & 1969 has a round Marx Logo on them. The 1967 did not. The 1969 has a picture of the front of the truck on one end with the address on the box under it stating, “Home office Woodbridge, New Jersey”. The battery compartment is clean and all the lights are in working order. The 1967 states, “Made in USA” on the end of the box. The truck measures approximately 13″ in length and complete with excellent decals (see pics). It has working headlights and taillights operated by a switch on the bottom of the tanker, and removable hose. The box on all sides is as close to perfect you will find in decades with only a area on one side that has some small paper loss (see pics). 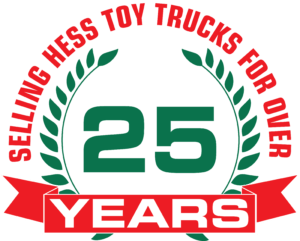 1964 Hess Truck & Box – Great Starter Piece!